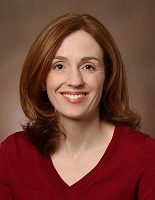 Dr. Marian (Emmy) Betz, MD, MPH is a board-certified emergency physician who works clinically at the University of Colorado Hospital Emergency Department (ED) and also conducts research in injury epidemiology and prevention. She received her medical degree and Masters in Public Health degree from Johns Hopkins. Dr. Betz's primary areas of research expertise are "lethal means restriction" (i.e., limiting access to guns and other lethal methods for those who are suicidal) and the care of suicidal patients in EDs. She has worked with numerous state and national organizations on issues of suicide prevention. Her research has received funding from the National Institute of Mental Health, the American Foundation for Suicide Prevention, and the Emergency Medicine Foundation. In 2014, she was selected to serve on the Colorado Suicide Prevention Commission, and she chairs the Commission's committee on emergency services. In 2015 she was asked to give a TEDxMileHigh talk about suicide prevention. Dr. Betz also conducts research related to geriatric injury prevention (with a focus on older driver safety) and is a current recipient of a Paul Beeson K23 Career Development Award from the National Institute on Aging. She is also a passionate advocate for women's leadership and career development and co-founded and co-leads a local "Lean In" group for women in medicine and science.